Health benefits of dates are quite well known. Dates are full of natural fibers and other key vital nutrients. It is powerhouse of vitamins and minerals. One date daily can also keep doctor away. These sweet fruits from the tropical oasis can promote good health and help to keep away from diseases. 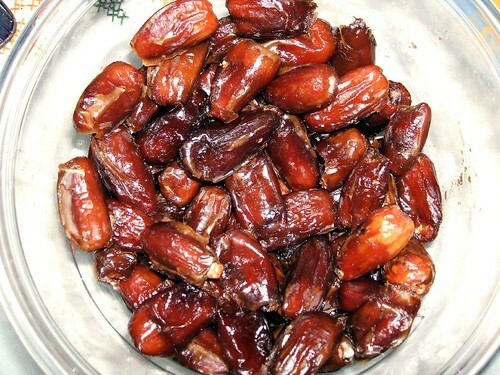 Dates have been part of regular food of the middle east. Evidence has been found that dates were used in Indus Valley and Harappan civilization almost 5000 years ago. Dates flourished in ancient Mesopotamia and prehistoric Egypt. Date fruits were used for making wine. Trading community brought dates to Europe and Africa and with colonization the fruit has spread across globe. Dates have found several mentions in religious text of Bible and Quran. In Islamic culture, dates and yogurt or milk are traditionally the first foods consumed for Iftar after the sun has set during sacred month of Ramadan. Dates are fruits of Date plam tree (Phoenix dactylifera). These fruits are generally darkish brown oval shaped drupes found in large groupings or clusters. When immature they are yellow in colour, however when ripe they turn darkish brown. Dates ripen in four stages, which are known throughout the world by their Arabic names kimri (unripe), khlal (full-size, crunchy), rutab (ripe, soft), tamar (ripe, sun-dried). Date fruit is consumed in all phases. These days there are several varieties of date palm being cultivated. The type of fruit depends on the glucose, fructose and sucrose content.